Originally published in 1969. In the seventeenth century neither the literary genre nor the term ‘autobiography’ existed but we see in seventeenth-century literature many kinds of autobiographical writings, to which their authors gave such titles as ‘Journal of the Life of Me, Confessions, etc. This work is a study of nearly two hundred of these, published and unpublished, which together represent a very varied group of writings. The book begins with an examination of the rise of autobiography as a genre during the Renaissance. 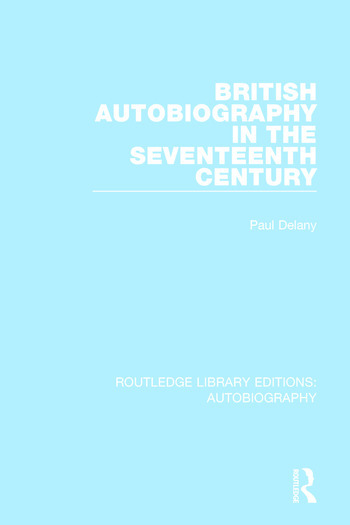 It discusses seventeenth-century autobiographical writings under two main headings – ‘religious’, where the autobiographies are grouped according to the denomination of their writer, and ‘secular’, where a wide variety of writings is examined, including accounts of travel and of military and political life, as well as more personal accounts. Autobiographies by women are treated separately, and the author shows that they in general have a deeper revelation of sentiments and more subtle self-analyses than is found in comparable works by men. Sources and influences are recorded and also the essential historical details of each work. This book gives a critical analysis of the autobiographies as literary works and suggests relationships between them and the culture and society of their time.